The Lord tells us through Zechariah to “Show mercy and compassion to one another…” These verses outline some universal values that God seems to think are important. And just from driving around in Dallas traffic, I’d have to say that mercy and compassion are in pretty short supply. (And that’s just in MY car; from the way many others drive, I don’t think there’s much mercy or compassion radiating from THEIR cars, either! Hard hearts are everywhere!) The Lord encourages us to be just, to drive considerately, to help those who are less fortunate, and to refrain from plotting evil against each other. These seem like pretty simple things to do, but how well do we do them? Encountering justice and consideration in our culture is an exception rather than the rule. Besides encouraging us to pay attention to the Lord’s values, Zechariah also says there are results that come from NOT paying attention, from stubbornly turning our backs on God, and for refusing to listen to Him: our hearts can become as hard as flint. What do you suppose he meant by that? 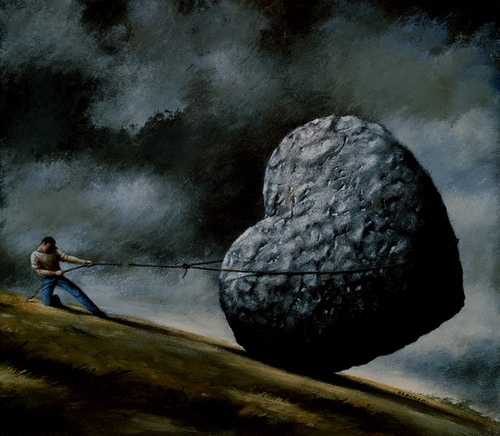 Hardened hearts become shielded from intimacy and they block themselves off from being vulnerable or open. Hard hearts have no mercy or compassion, no love, and no life. It makes sense that if God is love, and we shield ourselves from Him, then it follows that our hearts will not reflect His attributes and character. Treat others with respect, and have compassion towards each other. Don’t be surprised to find your hardened heart has turned to stone. Just don’t forget it may be more than feelings that you lose.